Finally a new product that gives confidence and security to the Martial Artist when breaking or holding boards for practice, demonstration, testing etc. The patented Bolder was designed to protect the fingers of the person holding the board and also to eliminate the hesitation of the person striking the board for fear they will kick or strike the fingers of the board holder. The Bolder like so many board holders does not get mounted to a wall or heavy bag so it can be taken out on the floor, to the park or anywhere to break boards. The Bolder is light but very durable. MA Toolz Bolder was designed around The Ultimate Martial Arts Boards. The Bolder also holds 1 inch and 1/2" wood boards. The Bolder comes with replaceable rubber discs to support both the UMAB boards or 1" wood boards. Are you tired of getting your fingers kicked? The Bolder is an effective board holder that will eliminate injury to your fingers when holding boards for your fellow Martial Artists. Wouldn't it be nice to kick a board and not worry about injuring the person holding the board? The Bolder will give you peace of mind that you never had before when breaking boards. Now you can practice breaking all you want and your fellow Martial Artist's fingers are protected. Now you can kick or strike with the confidence you need in order to improve accuracy, speed and power! MA Toolz Bolder was designed around the "Ultimate" Martial Arts Board. The Bolder can also hold 1 inch and 1/2" wood boards. Consists of two handles and comes with both sets of discs. (Black and Grey) to support the UMAB rebreakable boards or wood boards. Can easily be held at various angles and heights for various kicks such as Ax Kicks, Reverse Roundhouse Kicks and other high kicks that bulky holders or wall mounted holders cannot accomodate. 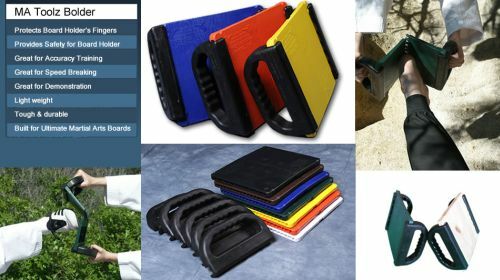 Protects the board holder's fingers from injury and it gives the kicker more confidence when breaking boards because the kicker knows they won't kick the holder's fingers. Great for accuracy training, speed breaking, testing, demonstration etc. Why take a chance injuring your fingers or your students fingers when you can protect them with the Bolder. Comes with 2 sets of Black Discs (8 ea) and 2 sets of Grey Discs (8ea) to hold both wood boards and rebreakable boards. Replacable discs available. Do not store boards in the Bolders to increase life of discs. Just adhere 1 set of the discs to the inside of the channel depending on the type of boards you break. When the boards are broken, they don't go flying across the room nor land on your toes but stay safely in the Bolder to protect you from injury.